Recently, architect and historian Win Perry of Nyack came across an old handwritten copy of the Lockhart Patent, dated to 1742. It had been acquired by his father at some time in the past. After having it appraised, he will donate it to the Palisades Free Library. In this article you can see pictures of the beginning and end of the patent. The full text of the patent is shown in Alice Haagensen’s book, Palisades and Snedens Landing, on pages 140 and 141. The Tappan Indians, a branch of the Lenape culture, were the only human inhabitants of this area when Henry Hudson sailed up the river in 1609. After the Dutch West India Company bought Manhattan Island in 1626, wealthy settlers began to buy large pieces of property, called patents, along the Hudson River as investments. In 1669, Claude Valott and three associates were granted a large tract of land on the west side of the Hudson, called Tappan, running four miles along the river and three miles back, on condition that the land be settled within seven years. They failed to do this, and in 1687 the province of New York confirmed the sale of the southern half of Valott’s patent, two miles along the river and three miles deep, to Dr. George Lockhart, a New York physician and land speculator of Scottish descent. 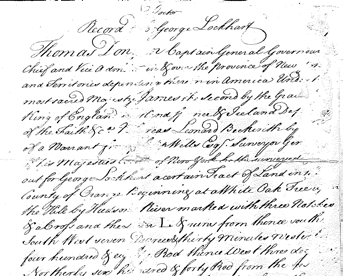 There is no record of Lockhart ever having lived on his land. 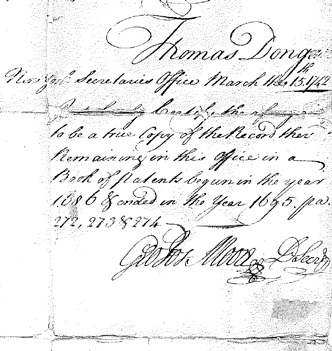 On October 20th, 1687, less than two months after his patent was finally confirmed by New York, “George Lockhart of the Citty of New York” mortgaged or sold the whole tract to William Merritt for 353 pounds, 17 shillings. William Merritt’s son John was married to Lockhart’s daughter Janet. It was Merritt who built the first house on this land, later called Cheer Hall. The patent begins: "Recorded by Doctor George Lockhart. 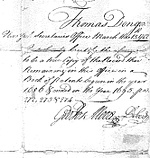 THOMAS DONGAN Capt. Genl Governour in Chief and Vice Admiral in and over the Province of New York and Territories depending there on in America under his most Sacred Majesty James the Second by the Grace of God King of England Scotland France & Ireland Defender of the Faith &c WHEREAS Leonard Beckwith by virtue of a Warrant from Philip Wells Esqr Surveyor General of his said Majesty’s Colony of New York hath Surveyed & Laid out for George Lockhart a certain tract of land in the County of Orange." In 1700 the census documented 14 people living here; today there are more than 1200 residents in Palisades. In the intervening years, as roads were built going south and north, the community spread north along what is now Route 9W and south along Closter Road. Oak Tree Road wasn’t built until 1823. Settlers from England, Germany, and Holland came to live and farm here, subdividing the land and intermarrying with each other. Some of these were Snedens, Lawrences, Posts, Manns, Gesners, Concklins, and Coopers. All are now gone, although their graves still exist in the Palisades Cemetery. To learn more about Palisades history, come to History Day, 10:00 am to 1:00 pm on Saturday, May 16 at the Community Center. Some of you may remember the history panels shown 10 years ago that detailed Palisades history through the centuries. A number of books on Palisades history will also be on display and for sale.